Christmas is the perfect time for family and friends to catch up, and writing an annual Christmas letter is a great way to let others know what your family has been up to in the past year. Annual Christmas letters are sometimes mocked for being over-the-top with enthusiasm, or descending into bragging about the family, but what you choose to write about is up to you. 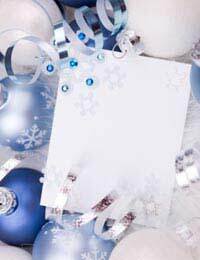 Many people send out annual Christmas letters instead of Christmas cards, so including pictures, using seasonal paper or adding other festive touches is always appropriate. The content of an annual Christmas letter tends to focus on the events of your family in the past year. Avoid trying to include every little thing that each member of the family said and did, and instead focus on the big events that took place. Also avoid using too many adjectives and adverbs, for example make sure that not every activity was "brilliant" and not every outcome was "just wonderful". Similarly, keep exclamation points to a minimum or else you run the risk of coming across as over-the-top or having a forced cheerfulness to your writing. While most of this information will be the same for everyone who receives the letter, consider changing a few lines at the bottom of each or adding a handwritten post script to personalise your letters for each recipient. An annual Christmas letter can be formatted any way you want. It's most likely not necessary to format an annual Christmas letter as a formal business letter with both the writer and recipient's postal address included but it might be a good idea to include your address so that others can respond without saving the envelope too. A formal salutation (Dear) is probably a good idea, but a formal closing (Sincerely, Kind Regards, Best Wishes) is likely too distant for the family and friends receiving the letters. Using 1 inch (2.5 cm) borders throughout will help keep the letter easy to read, as will short paragraphs with a space between each. Adding a seasonal or holiday border is perfectly appropriate for Christmas letters, as is printing on Christmas or seasonally themed paper. Postal delivery, or hand delivery with a gift, is always appropriate for annual Christmas letters. It can't believe it's time for our annual Christmas letter again. 2009 has certainly flown by. It brought both trial and opportunities to our family, but we have emerged from it stronger than ever. The year started out well with a wonderful trip to the Caribbean with Rhys' family. The boys (Rhys included!) all loved playing on the beach and in the waves, though every last one of them got sunburns and had to stay indoors for days afterwards! When we got home we were a little worried about Rhys' sunburn still and he went to the GP to get some advice. That appointment began an investigation that ended with a diagnosis of skin cancer. Thankfully it was caught early and we were able to have it treated immediately. During treatment Rhys took a bit of time off work and began reading up on his old passion, photography. In the early autumn Rhys signed up for a photography class and we all became his very willing subjects. The boys in particular loved to have him snapping away during their football matches. I wasn't so pleased that he kept sneaking up on me and taking pictures of me scrubbing pots or hanging out the washing, but somehow he even made those photos seem interesting. In fact, his work will be show in a small exhibition at the start of next year and we would love it if you would be able to attend. I will send along more information when I have it but don't worry about accommodation as you are always more than welcome to stay with us. Aside from these big developments 2009 was otherwise a rather restful year, as peculiar as that sounds. We got to spend quite a bit of time together as a family and now the boys are clamouring for their own cameras so that they can spend even more time with their Dad. I shudder to think what kind of pictures of me will surface then, but I'm fairly certain Santa Claus has taken note of their requests. I hope that you have had a slightly less eventful year than we had, but one just as restful and including just as many or more bright moments. We miss you, and look forward to hopefully seeing you soon!